The Previzion Export Checker is a tool that helps you check for common scene export problems. This enables you to be aware of the most common mistakes, before exporting into Previzion. Thanks to some of the upgrades to Windows 64 bit operating systems, Previzion is able to handle a great deal more in terms of scene size. This tool allows you to work with exports meant for the 64 bit OS or the 32 bit OS. You will notice a great difference in the amount of textures and triangles 64 bit is able to handle as opposed to 32 bit. This removes all intermediate nodes used in the construction of objects. The function will delete any skinning or animation deformers in your scene as well as intermediate polygonal modeling nodes. This function works as the previous button except that it preserves skinning and animation deformers. Texture usage is calculated in pixel area. The image below describes the how space is measured. In addition to providing numeric feedback for texture usage, The Export Checker also provides color feedback to help artists identify if they’re about to run out of texture space. The Previzion Export Checker includes the Detailed Listing of Texture Sizes window. Individual texture sizes are important to know because any texture that is over the 4K resolution in width &/or height may produce an error while rendering in Previzion. This window shows texture dimensions, AND when a texture is too large, will give you the option of editing the image. Item 1 shows the scroll bar on the right. Make sure to view the entire scrolling section!! Item 3 in the above illustration shows the “Resize” button. When pressed, this will open the texture in your specified image editor of choice. When exporting from Maya to FBX, the scene units should be in “cm”. Failure to adhere to this creates scaling errors in Previzion (which can be seen in geometry and texture projections). When activating the Previzion Export Checker, the interface automatically detects your scene units, reports the current setting, and gives you the option of switching to “cm”. Notice that once the scene units are switched to cm that this button is now greyed out. When this button is greyed out the scene units are already set to cm. 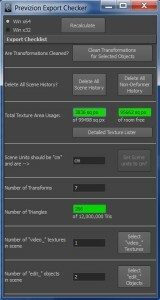 After Cleaning Transformations and Deleting Scene History the Number of Transforms should drop considerably if the scene hadn’t regularly been cleaned. It is good practice to often clean the scene and delete history, it is just as important as saving often. When the scene starts to get cluttered with unclean history, Maya can start running slower and sometimes crash. Currently, Previzion can handle up to 3000 Transforms in a scene without dropping frames. This section is based on your selection of Win x64 or Win x32. When you are in x32 the max number of triangles is 200,000 while in x64 it is 12,000,000. As you reach the maximum the boxes will turn from green to an orange and then red once the maximum has been exceeded. Number of Videos Textures Named with “video\_” prefix? This section simply counts the number of textures whose name begins with video_ and reports the amount. If none of these textures are found, then the text box turns red indicating there are “No” video textures. This gives you a count of the number of objects in your scene that will be movable inside of previzion. The button in the right column will select all objects in the scene that are edit_ objects. The purpose of posting this number is to give the artist a last change to corroborate the given results with her expectations. If she knows there must be 3 movable objects in the scene but the Export Checker is showing only 2, then she can quickly correct the problem before performing an export. 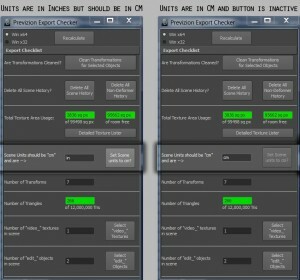 For information on how to set up movable objects in Previzion, reference Editable Transforms section.